Iwan Effendi (Artistic Director) and Maria Tri Sulistyani (Director) from Papermoon Puppet Theatre in Indonesia will have a residency in Museum for a month to make a creation and present a new performance. It will be 'community project' that the visitors including child can attend workshops, and the artists make a new piece with the local artists. We have open studio which shows you the process of creation during the artists stay. The workshop is to make your imaginary creature. We'll use them for our performance on 14th and 15th Aug. Working time：Please come to the gallery from 10am to 1pm. Time required：It depends on the participants. If you can't finish your creation, you can come to the gallery again and work by yourself during the term. ＊Parental Guidance for child under 10 years old. ＊You can bring the creature back to your home after 1st Sep.
'HIDE and SEEK' is a story for adults and child who like to hide under beds and tables to have their own world. Enjoy the secret world which is made by handmade puppets, mysterious creatures, sound and shadows. ＊The numbers of tickets of each performance is 50. When we sold out all advanced ticket, we'll not sell any at the counter on the performance day. ＊Age limit: children over 3 years old. Pre-school child also need tickets. ＊There is no seats, but ask you to sit on the floor. We exhibit the puppets and props that we use on the performance until 31st Aug.
Papermoon Puppet Theatre was founded as a brainchild of Maria Tri Sulistyani (an illustrator, writer and a former theatre performer) and Iwan Effendi (a visual artist). Since 2006, this couple has been doing lots of experiments on the arts of puppetry. Based in Yogyakarta, Indonesia, In a country with world-renowned puppetry traditions, the young, expert artists of Papermoon are extending the form with their mixed-media productions, and creating works that imaginatively explore identity and society. Not only making performances, Papermoon Puppet Theatre also presents its artworks through visual art installations, and shares its knowledge by making lots of workshops, and initiates international biennale puppet festival calls Pesta Boneka since 2008. Papermoon have been presented its artworks not only in Indonesia, but also in other places, such as New York City, Rhode Island, Philadelphia, Washington DC, Iowa, Easton, Baltimore- United States of America, Amsterdam- Netherland, Yokohama-Japan, India, South Korea, Malaysia, Singapore, Melbourne and Darwin-Australia. ＊Holders of physical disability cards, care assistance cards, disability cards, war wounded veteran cards, A-Bomb victim health cards, and 1 accompanying caregiver will receive a 30% discount. Physical disability discount advance ticket sales will be handled by the Museum Shop. *Box office will open from 5th Jun. If you will be watching the performance and require child-care, please make a tentative booking by phone. Child-care is limited to pre-school children aged 6 months and above. Contact: Call to +81-88-866-8000 (9am-5pm) before filling in the application form. Tosa Wave is also available at your mobile phone. Kayaking in the Shimanto River! 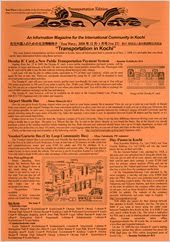 Proposed by the Kochi International Promotional Meeting organized in 1989, the Kochi International Association (KIA) was founded as the core of a non-governmental international organization by both public and private associations in Kochi. The fundamental plan for this was based off the “Kochi Basic International Exchange Promotion Plan” formulated in March 1990. KIA was originally established as an incorporated foundation in January 1990 and was changed into the first public interest incorporated foundation in Kochi in September 2010. Copyright Ⓒ 2011 Kochi International Association (KIA). Watermark theme. Powered by Blogger.